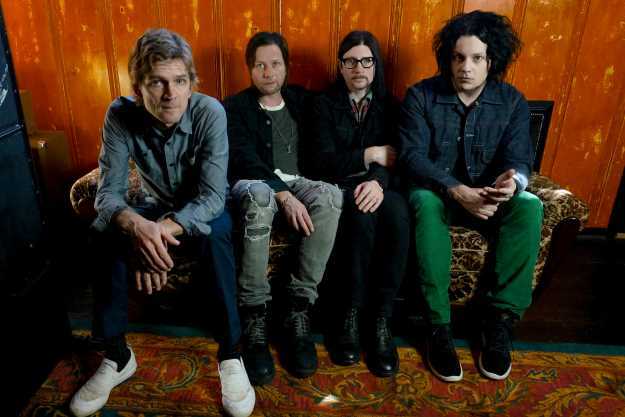 The Raconteurs - Jack White, Brendan Benson, Jack Lawrence and Patrick Keeler - have announced their third album. Help Us Stranger will be released via Third Man Records on June 21st. The group's first new album in more than a decade, the LP follows 2008's Consolers of the Lonely. Written by White and Benson, with the exception of their cover of Donovan's "Hey Gyp (Dig the Slowness)," the group recorded the 12-song set at Third Man Studio in Nashville, Tennessee. Produced by the Raconteurs and engineered by Joshua V. Smith, the album features contributions from keyboardist/multi-instrumentalist Dean Fertita (The Dead Weather, Queens of the Stone Age) and sisters Lillie Mae and Scarlett Rische. A limited edition electric green, black and copper swirled vinyl LP, which features moving image lenticular cover art, will be available via Third Man Vault subscriptions' Vault Package #40. Pressed at Third Man Pressing in Detroit, Michigan, the 180-gram marble vinyl edition includes a companion 7-inch single that houses early demo recordings of the LP's "Help Me Stranger" and "Somedays (I Don't Feel Like Trying)." The package comes with a bandana designed by Keeler and a Raconteurs slip mat. Vault members will also receive first pre-sale ticket access to soon-to-be-announced Raconteurs headline shows. The deadline to subscribe for Vault Package #40 is April 30th. This weekend, the band convenes for its first live show in eight years during the Third Man Records 10th Year Anniversary event in Nashville, Tennessee. They are also scheduled to perform at a number of festivals around the globe, including Railbird Festival on August 10th in Lexington, Kentucky and Woodstock 50 in Watkins Glen, New York on August 16th. In December, the Raconteurs returned with their first two new songs in 10 years, LP tracks "Sunday Driver" and "Now That You're Gone." 5. "Shine the Light on Me"
6. "Somedays (I Don't Feel Like Trying)"
7. "Hey Gyp (Dig the Slowness)"
9. "Now That You're Gone"